Whether you've overbought or onsourced the wrong products or have merchandise on hand with little shelf-life left in it, “stale inventory” is a common (and normal) challenge for online merchants. But no matter what you sell or where you sell it, holding on to stale inventory is a costly business practice. The Inventory Stale report shows you at a glance what you have in stock and how long it will take to sell out at current pace. You can search or order by a given column such as Months to Sellout. 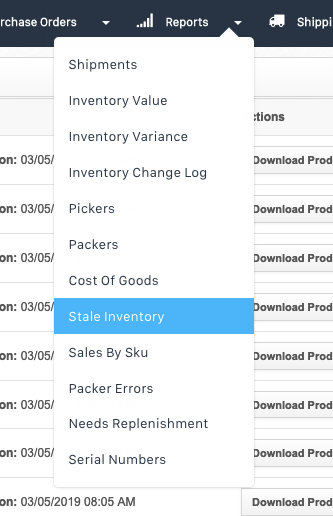 The Stale Inventory report is available in the reports section. If you're logged into your ShipHero account, you can view it here. You can also navigate to the report from the Report option available on the top navigation menu. You can adjust the columns available by selecting which columns you want to display in the report. You may want to download the report to use in your own program, or to import into another application. There are 3 download options available. 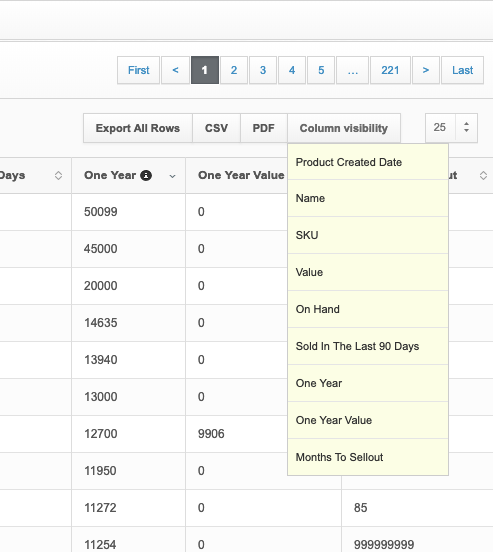 Export All Rows - this option will generate a CSV file containing all data which you can then download. CSV - this option will download a CSV file of the information you are viewing. PDF - this option will download a formatted PDF of the information you are viewing.